We have never had a true, Family Meeting, before we began a few weeks ago. Sure, we talked at dinner and casually discussed ideas and plans, but it was never a “formal” thing. When I was talking with another Mom a few weeks ago, she mentioned her family had weekly meetings, complete with agendas and minutes! I decided to give it a try and I was surprised at how helpful and fun it really was! 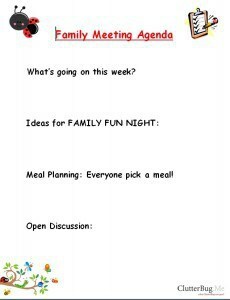 My kids love Family Meetings, so that is a bonus, but more than that, they were actually really helpful with my weekly planning! My kids offered amazing ideas for birthday gifts, meal planning and activities for our weekly Family Fun Night. The meeting not only helped me get organized for the upcoming week, but it was such a wonderful bonding time for our family. I realized that I don’t ask my kids for their input in decisions enough and when I do, their insight is always creative and extremely helpful. YOU SHOULD HAVE FAMILY MEETINGS TOO! Give it a try, you may be surprised at how much you LOVE them! Here is a copy of our agenda for you to download and print off! DIY Photo Holder Frame for Under $3! Give your window a splash of colour..even if you don’t sew!